2 Jews open fire after 20 Arab rioters throw stones at them. The Jews are arrested while the Arab perpetrators are not taken into custody. Two Jews opened fire Wednesday morning after they were ambushed by stonethrowing Arabs near the community of Ofra in the Binyamin region. About twenty Arab rioters threw stones at cars on the main road traversing the area. The two Jews were afraid they would be lynched and opened fire at the rioters, wounding one of them. The Jewish men were taken into police custody. Their lawyer, Attorney Itamar Ben-Gvir, stated that the two had acted in self-defense after they were attacked by stonethrowers. The two men were later released from custody on bail. Attorney Ben-Gvir said that "there was no justification to arrest these men in the first place. We demand that the police locate and arrest today all the stonethrowers who participated in this attempted murder of Jews." 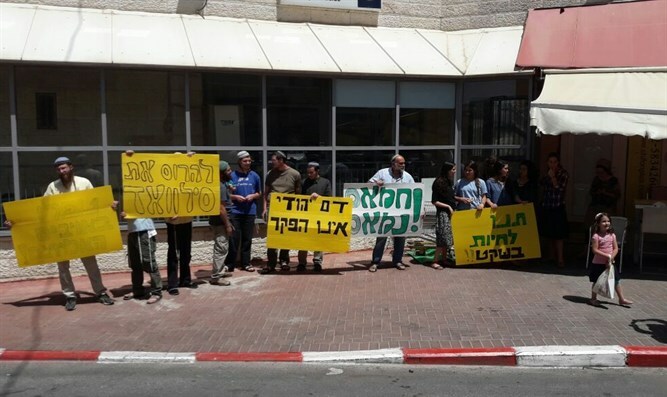 A short time before the two men were released, activists from the Jewish Strength movement demonstrated in protest against the arrest of the two Jews and against the police who chose to arrest the Jews rather than the Arab rioters.